NEW YORK (CNS) — Positive values, including altruism, are highlighted in “The Hunger Games: Mockingjay, Part 1” (Lionsgate). Together with the absence from the film of most problematic content — a good deal of stylized combat aside — those upright ethics make this sequel a worry-free choice for the parents of targeted teens. 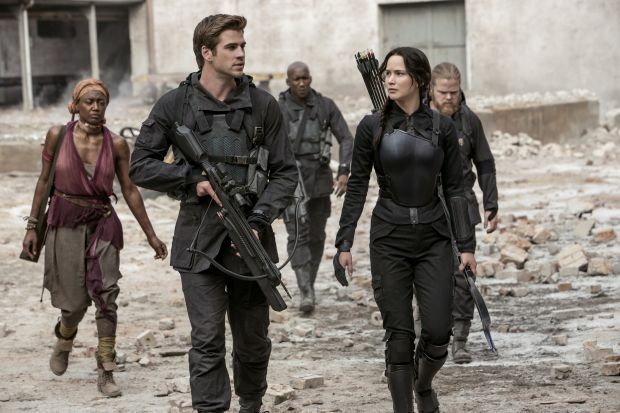 The third installment of a four-part series based on best-selling novels by Suzanne Collins, the movie also offers satisfying — and occasionally stirring — action played out against the backdrop of the same disordered futuristic society in which its predecessors were set. For those who are new to Panem, the dystopian North American nation that serves as that setting, here’s the (raw) deal: A cosseted urban elite, led by President Coriolanus Snow (Donald Sutherland), rules oppressively over a group of outlying districts populated by downtrodden workers. Each year, some of the children of the underclass are compelled to participate in the brutal survival tournament of the title — from which normally only one victor emerges alive. Having been subjected to the games twice — first in a normal round, later as part of an all-star version — franchise heroine Katniss Everdeen (Jennifer Lawrence) has become a huge celebrity, not least because she managed to subvert the rules of the contest on both occasions. Her latest act of defiance, showcased at the end of the last film, coincided with, and helped spark, the outbreak of a rebellion against Snow’s regime. The opening of this chapter finds Katniss holed up in a huge bunker that serves as the headquarters of the uprising. It leaders — President Alma Coin (Julianne Moore) and former tourney supervisor-turned-rebel Plutarch Heavensbee (Philip Seymour Hoffman) are intent on using Katniss as the inspiring symbol of their movement. Though Katniss is initially reluctant to take on that role, exposure to the ruthless devastation Snow’s forces have inflicted on the area where she used to live convinces her to play her part. But things become complicated when her sweetheart, Peeta Mellark (Josh Hutcherson), whom Snow is holding captive, becomes a tool in the president’s propaganda campaign aimed at stamping out the revolution. As scripted by Peter Craig and Danny Strong, the romantic entanglements in director Francis Lawrence’s sci-fi adventure are so chaste that a single kiss between Katniss and Gale Hawthorne (Liam Hemsworth), the lad who pines for her, takes on great significance. And Gale, it turns out, is not only well behaved, but heroically selfless in the pursuit of Katniss’ welfare. For those willing to buy into the mythos behind it all, the progress of the revolt in which Katniss finds herself caught up makes for an invigorating ride. As for unimpressed holdouts, they can pass the time monitoring the dialogue — in vain — for any hint of profanity or other verbal trespasses. The film contains some bloodless but potentially disturbing violence. The Catholic News Service classification is A-II — adults and adolescents. The Motion Picture Association of America rating is PG-13 — parents strongly cautioned. Some material may be inappropriate for children under 13.